This online Physics II Lecture and Lab course is a four-credit-hour, algebra-based course delivered at a distance and includes a hands-on physics laboratory. It is designed for individuals who need a semester of Physics II as a prerequisite to apply for admission to health professions programs. Physics II emphasizes a balanced approach to learning and demonstrating the principles of physics. Students will practice their understanding of the course material through hands-on laboratories, written and online homework problems, and integrative projects, supported by video lectures and extensive readings. The accompanying text provides applications of topics to a variety of biomedically-rich examples reinforced by online homework activities. The overall goal of this online course is to provide the student, interested in the health professions, with an introduction to physics that emphasizes the concepts that are the foundation of sciences, which the students may encounter in their professional studies. These topics include thermodynamics, waves and sound, electrostatics, circuits, magnetism, light and optics, and atomic and nuclear phenomena. 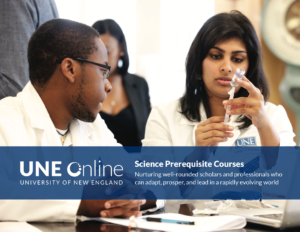 The laboratories that accompany Online Physics II for the Health Professions contain learning objectives similar to any other Physics II lab, accomplished on any college campus, except that students work at home. An emphasis is placed on understanding the concept behind each Online Physics II Lab and use of the scientific method required by today’s healthcare professionals who are expected to have a general understanding of how science and the scientific method contribute to their profession. Homework exercises are designed to provide students with practice to solve physics problems. Online exercises are designed to integrate physics concepts with common health science applications. Like the online quizzes, the problems provide quick formative assessment of student understanding. The labs have been developed specifically to meet the requirements for successful entry into the health profession, in particular to pass the physical science portion of entry exams such as the MCAT. Students purchase a state-of-the-art handheld device that contains a variety of instruments to perform experiments and collect data. Following the course instructor’s introduction for the laboratory, the student sets up the appropriate lab experiment and undertakes the experiment. The student will develop mental models from the hands-on activities. The student starts by making a prediction and obtains experimental data relevant to that prediction by making measurements in real time. The student analyzes the data obtained, draws conclusions and makes applications. A quiz concludes each unit. Each experiment includes a lab report sheet that will be turned in for a grade. What happens if a student has a problem with an experiment? Discussion boards can be used for communicating and troubleshooting with classmates and online videos are also available for reference. Additionally, students can contact their instructor for assistance. Many students are nontraditional students who have elected an online course for flexibility. Since the course is self-paced, you may complete the course in fewer than 16 weeks. However, working at the pace typical for a four semester-hour course, most students will take the allotted 16 weeks to complete this online Physics II course. Students will need a minimum of one semester of college-level algebra and background knowledge in trigonometry. One semester of physics (PHYS-1010 or equivalent) is highly recommend.